When it comes to diversity, the ClackaCraft 16WF is the real deal; it is designed to float small, medium and large flowing rivers throughout North America. Originally intended for the professional fly fishing guide, the 16WF has evolved into a boat desired by fisherman that want a multi-use drift boat that will float a wide range of waters, from small streams to large rivers and lakes. ClackaCraft has integrated their highly successful GulfStream® into the 16WF. Engineered to work harmoniously together, ClackaCraft’s Exclusive GulfStream® bottom and Tunnel Hull Technology have elevated the “row-ability” of the ClackaCraft 16WF, creating a great handling and highly maneuverable boat. After 30 Years of building drift boats we know what Fly Anglers want: spacious, roomy interiors with nothing to trip over or to catch fly lines. The ClackaCraft 16WF (Weight Forward) model is designed for serious fishermen. When compared to the other Standard Side Models, the interior of the 16WF sits 6" foreword for better balance. Because of the 16WF's ample flat bottom, it has a very shallow draft, even when loaded to capacity with fishermen and extra gear. The front and rear swivel fold-down seats are mounted on pedestals that allow thefisherman to walk completely around the front and rear seats for greater mobility. As a bonus, the lid hinges forward for access to the dry storage compartments beneath the seats. Both the front and rear fishermen enjoy large level casting platforms for solid footing and comfort. 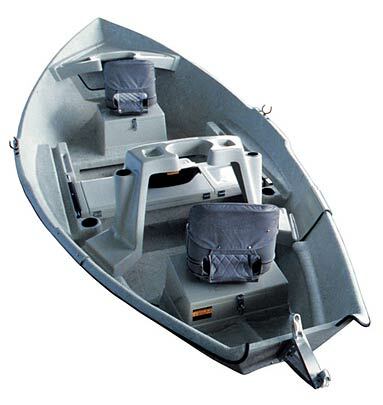 The 16WF comes standard with an adjustable oarsman's bench seat for level balance as the load configuration changes. 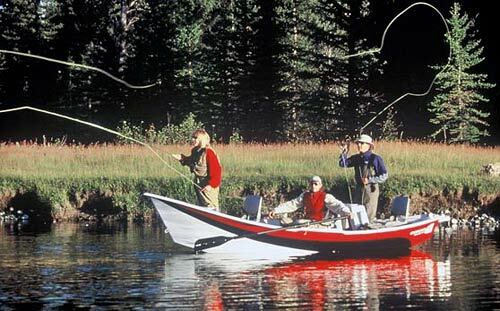 Specifications - 16' x 57"
Mountain Driftboat is owned and operated by Gary Beebe, a 28-year fly fishing guide veteran. Gary has guided in Montana, Idaho, Wyoming and Colorado. Because of Gary's personal knowledge of the rivers in the West, he can help you pick the driftboat that will be right for you.